I received a lot of heavenly christmas cards over the last few days, which I would love to show you. Ich habe die letzten Tage so viele schöne Weihnachtskarten erhalten, die ich euch natürlich nicht vorenthalten möchte. This card is from my beloved Jacqui, who I want to thank from the bottom of my heart for organising the WoJ advent calendar. Thanks Jacqui, you helped to add a lot of magic to the last weeks!! She used Herb with teacup for this fabulous creation. Diese Karte ist von meiner lieben Jacqui, der ich von tiefstem Herzen Danken möchte, dass sie den WoJ advent calendar für mich organisiert hat!! Sie hat Herb mit Teetasse für dieses tolle Werk verwendet. 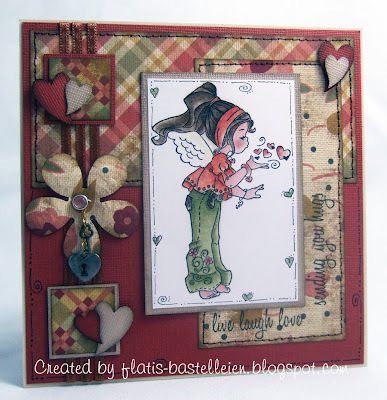 A stunning card from Sonja featuring Melinda blowing kisses, I love the distressed look and her hand-drawn swirls!! Eine traumhafte Karte von Sonja mit dem Motiv Melinda bläst Küsschen, ich liebe den "distressed" look und ihre handgezeichneten Schnörkel! I was very happy to recieve this card from Renata and I was impressed by her colouration style! Ich habe mich sehr über diese Karte von Renata gefreut und ihr Colorationsstil hat mich sehr beindruckt. My dear friend Murielle sent me this extraordinary Santa Charlie card. 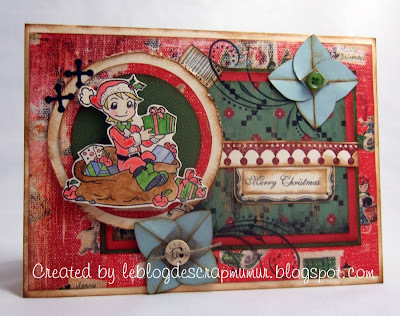 Doesn't she have the most extravagant cardmaking style?? Love it!! Meine liebe Freundin Murielle hat mir diese aussergewöhnliche Santa Charlie Karte geschickt. Hat sie nicht den ausgefallensten Kartenbastel Stil, den ihr euch vorstellen könnt?? Ich liebe ihre Werke!! Thanks for stopping by and enjoy the holidays!! Ich danke euch fürs Reinschaun und wünsche euch einen schönen Feiertag!! Merry Christmas, Katharina! I hope it is a safe and fun one for you and your family! You have at least 1 more Christmas card on it's way to you...sorry it's late! These cards are just gorgeous!!! A very Merry Christmas to you and all the best for the upcoming year!! Merry Christmas Katharina! I am so blessed to have met you this past year, and love your stamps! Da hast Du wirklich traumhaft schöne Karten bekommen. Ich finde die Karte mit Herb allerliebst, ich mag diesen kleinen Schneemann total gerne. 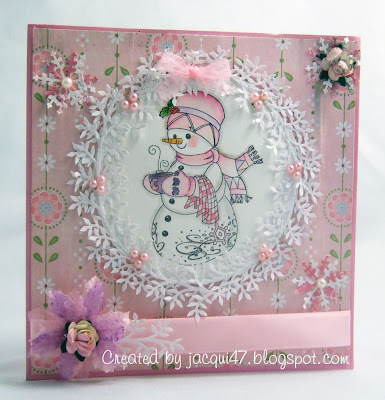 Wow wonderful cards and the one by Jacqui is so beautiful! Fantastic cards from such talented artists! I hope you remain having a fantastic holiday with family and friends. What beautiful creations by all! All that is left to say is how lucky you are to be surrounded by precious friendships Katharina. Blessed and Happy Holidays to you!